ACTIVITY in Interdisciplinary, Culminating Project. Last updated November 16, 2018. In this activity, students will learn through actively reading real-world chemistry articles. The close-read strategy is used as a way of enhancing student understanding and engagement by slowing down the reading process without detracting from the current curriculum. actively engage in a science-based article, by annotating the text while reading. make real-world connections to the chemistry content being taught in class. write a thoughtful reflection and summary of content communicated in an article. No safety considerations are needed for this activity. 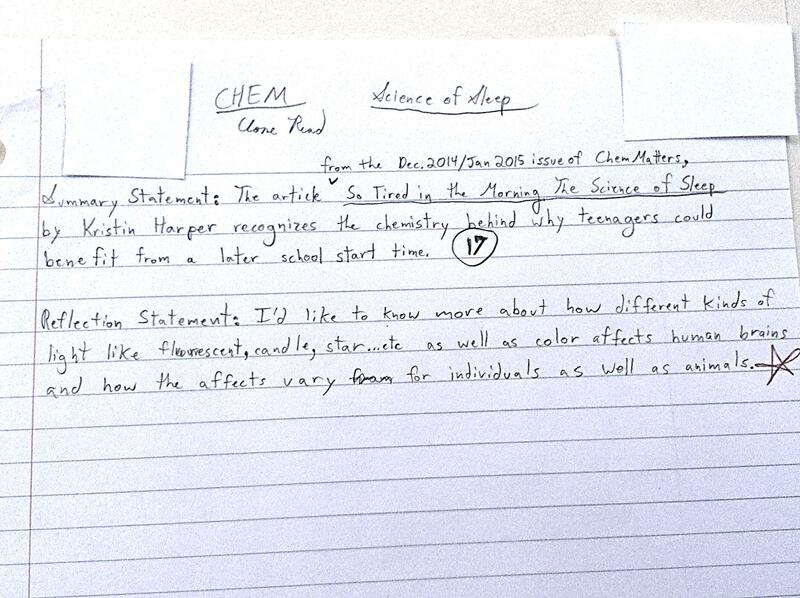 The chemistry close read is an active read of an article for depth of understanding. The strategy helps students navigate and access the sometimes challenging chemistry readings. The close reading strategy slows down the reading process, which is helpful for students with little interest or enthusiasm to read challenging expository text. 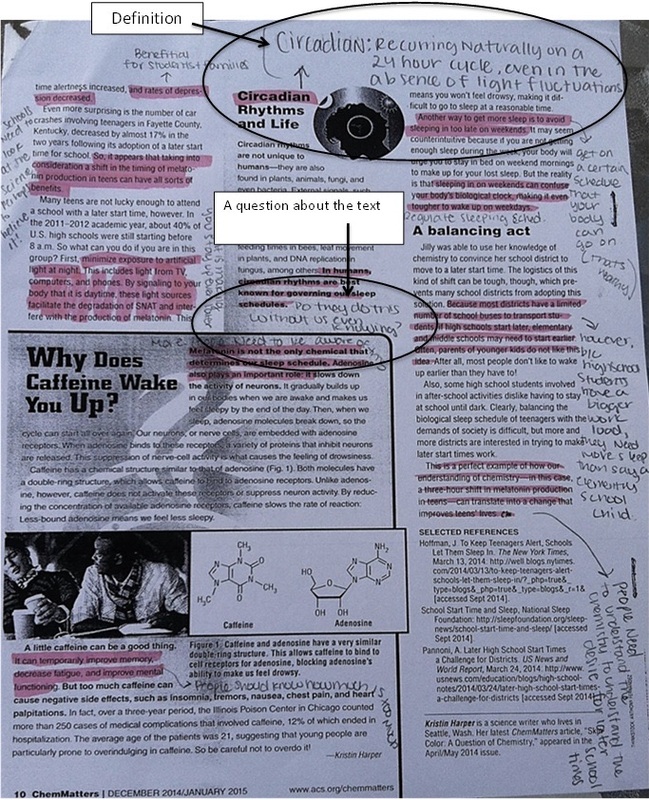 Each student is given a copy of an article to read and annotate. They should highlight or underline important or interesting ideas and then write in the margins next to the word or passage their thoughts, reactions, connections, and/or questions about the text. When the reader comes across a word that is new, they should circle it, look up the definition, and near the word write the definition. After reading the article, the student writes two statements: a summary and a reflection (see picture of student example for reference). Figure 1. This student work shows the definition of a word and the use of a question for a rich comment. At the beginning of the school year, I give students a sample close read and model what they should do. I pick something short in length (a paragraph or two) that is about something interesting. When students do the close read, they sometimes fall into the habit of writing shallow comments like “cool,” “very interesting,” or “wow.” Modeling thoughtful and insightful written comments helps set high expectations. Making meaningful and rich comments also emphasizes the importance of slowing down and re-reading at times. It is also good to include words that need defining, so if students skip over them, they learn the significance of understanding words as part of the context. Both the summary statement and reflective statement are also modeled at this time. These statements are the synthesis piece that addresses the “so what?” or purpose of reading the article. Most of the students in the chemistry class at our school have done close reads in their English classes, so this is a familiar process. This introduction to the close read usually takes 20 to 30 minutes, which leaves class time for daily work. The experience in the English class has shown that articles should be no longer than two to three pages. At times, the assigned article has connected with a topic being studied, but most of the articles have been selected because they are about a current event or fascinating research project. The articles have come from ChemMatters, Chemical & Engineering News, and local newspapers. ChemMatters comes with a free online Teacher’s Guide, which includes extensive and detailed reading guides for each article. Typically, two to three nights are given to complete the assignment. On the day the assignment is due, a short class discussion should occur. The assignment sheets for the chemistry class and the English class are included in the classroom resources section. For grading—In the beginning, I required six to nine comments per page. I also required one definition. The comments are quickly checked for richness, and a particularly good comment gets a mark of recognition on the paper. The real evidence of deep understanding is shown in the summary statement and reflection. Later, instead of counting the number of comments, focus on the richness of comments. Finally, the teacher can check the close read with a fast look so that only the ending statements need careful reading. The first, entitled “Chemistry Close Read,” is the two-page handout that I use in my chemistry class. The second, entitled “Article of the Week,” is the one-page handout that is used in the ninth-grade English class. I included it to support a collaboration effort that a chemistry teacher might want to establish with an English teacher. The third, entitled “Article of the Week Options,” is a one-page handout that is used in the ninth-grade English class. I included it to give teachers an expanded list of things that could be asked of students after they have done a close read. The fourth attachment is the student survey that I used at the end of the school year to collect feedback about the Close Read. Find these documents in the Downloads box. Close Read (6 points): Read with a pencil/highlighter in hand, and annotate the text. Annotating means underlining or highlighting key words and phrases—anything that strikes you as surprising or important, or that raises questions. Annotating includes writing your thoughts and reactions in the margins next to what you have highlighted or underlined. These need to be rich comments. Rich comments might begin with the word, what or why or any of the phrases that could also be used to start your reflection statement. Highlight or circle words you don’t know, and look them up! Write down the definition in the margin next to the word. The summary statement is 25 words or less; the author/title/source counts as 1 word. At the end of your statement, write the number of words in your statement and circled it. Reflection Statement (2 points): Use one of the following sentence starters and write a brief 1-2 sentence reflection statement for the article. A) I noticed. . .
B) I wonder. . .
C) I was reminded of. . .
D) I am surprised that. . .
E) I’d like to know. . .
F) I realized. . .
G) If I were. . .
H) I am not sure. . .
Expresses or reflects on his or her own life and experiences. Hooks with the problem and lets the reader watch him or her wrestle with it. Read an article about this activity in the September 2015 issue of Chemistry Solutions.